Lucky Ndinisa congratulated by Mabuza and other ANC officials for a job well done. 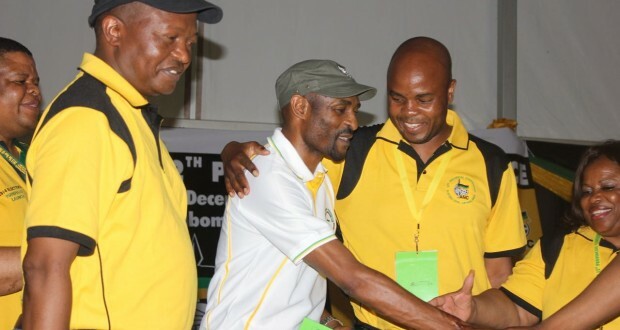 The 12th African National Congress provincial conference has come and gone, and David “The Cat” Mabuza has been reinstated – UNOPOSED. Predictably, he believes that’s a sign of unity of the organisation, but for those who have lost, even without contesting, the battle has just begun. The obvious losers are former provincial deputy chairperson David Dube, former provincial treasurer, Andries Gamede, but the biggest loser is Lucky Ndinisa, the former provincial secretary, even though he reportedly got the highest number of votes to stay in the provincial executive committee. He’s not the biggest loser because he will be joining the ranks of the unemployed, but because Mabuza will still reward him for a job well-done over the past seven years, while Mabuza will surely get rid of Dube and Gamede. He is the biggest loser because when the history of the ANC in Mpumalanga is written, his name will be alongside those of leaders who have led to the demise of the organisation. He was elected into the Provincial Executive Committee in a conference that was allegedly rigged in 2008 as a promising politician, but he leaves as a well-groomed puppet of his master. At the time, those who were responsible for rigging the elections were not prepared to talk because they were still in the good books of The Hurricane, as Mabuza was called at the time of his ascendancy to power. Ndinisa, however, should be credited that he inherited an organisation that had about 55 000 membership and managed to increase that membership to over 100 000 at one point. This was the goal that he shared with Ziwaphi during an interview in September 2008. Another of his goals, was that he would unite the membership of the ANC. This is an area where he did not succeed, partly because he was a product of a rigged conference, therefore his legitimacy was always going to be questionable. 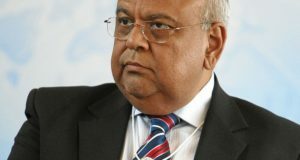 More importantly, however, was that he was serving under a chairperson who thrives on divisions. 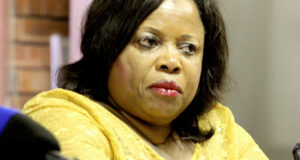 It came as no surprise as the first casualty of that policy was Charles Makola, who was Ndinisa’s mentor. During that interview, Ndinisa said that his age (36 at the time), should not be used against him. He said he was no longer a youth. But, one of the questions that Ndinisa failed to answer during that interview was whether he would be able to differ with Mabuza if he is told to flout the organisation’s principles. And it turned out that he was just not ready to play in the big league. Ndinisa also promised to increase ANC support in 2009. He was successful on this one. The ANC increased its support from 979 155 voters in 2004 to 1,152,698 in 2009. It must be said, however, that he reduced the percentage vote from 86% in 2004 to 85% in 2009. It would also be difficult to attribute that success and failure to him because he had just been in office for seven months. His real test happened during the 2014 national and provincial elections and he failed dismally. Under his watchful eye, the ANC dropped its electoral support from 1,152,698 in 2009 to 1 091 642 in 2014 – a drop from 85% to 78.8%. He leaves behind an organisation that had 27 members of the provincial legislature with only 25 members. He may not be entirely to blame though because of the emergence of the Economic Freedom Fighters, which can be blamed on the developments at national level. However, Ndinisa turned a blind eye when the chairperson of the organisation’s Ehlanzeni region, Ngrayi Ngwenya was assaulting ANC members. If he had done his job, the provincial leader of the EFF, Collen Sedibe would still be a member of the ANC. If he had done his job, the Secretary-General of the EFF, Godrich Gardee would still be a member of the ANC. If he had done his job very well Maviyo Ndinisa would be the regional chairperson of the ANC, but he lacked the guts, and the ANC is in the hands of apartheid National Party agents. Another of his goals was to introduce political education. Ndinisa said that he would start with members of the provincial executive committee, many of whom were still political virgins. This is one area that Ndinisa seems to have failed dismally. It was under his watchful eye that the ANC developed a Stratcon-type organisation called Skhonyane in Nkomazi. The organisation uses apartheid-era tactics of recruiting young people, feed them with alcohol and unleash them during conferences as voting cattle. Ndinisa leaves a legacy of an organisation that has no genuine branches. In Nkangala and Nkomazi there are allegations of fraud but he chose to do nothing, except of course to say, “we are investigating”. He leaves behind an organisation that was once having cordial relations with its partners, but leaves behind an organisation that is at war with its partners. An organisation that has programmes to attack, violently, activities of its partner, the SACP. He leaves behind an organisation that dispenses patronage and tolerates corruption. He was removed from office by delegates from branches that did not have branch general meetings (BGMs). Unlike Gamede, Dube and many others who will, in all likelihood, be joining the “Save The ANC in Mpumalanga” once Mabuza removes them, Ndinisa will benefit from Mabuza’s patronage. But he will go down the history of the ANC as someone who inherited a not-so-perfect organisation, but left us an organisation that is controlled by one individual. He is leaving behind an organisation where adults are made to show the master their allegiance by signalling three fingers, and those who don’t are punished. Ndinisa leaves behind an organisation that has declared war on its members, where a man who calls himself a cat declared that he would be making people to run. He has left behind an organisation that convenes a provincial general council to elect one individual who then decides whom to bring on board. Throughout his tenure the organisation’s communications machinery collapsed, and the organisational communications focuses on the master. The T-shirts and CDs that are supposed to be marketing the organisation are marketing a master with a derogatory symbol of three fingers. He leaves behind an organistion that has institutionalised corruption in all spheres of government. Ndinisa will be remembered for manufacturing an organisation that when its leader is sick, the organisation also gets sick. He leaves behind an organisation which has no respect for its own constitution. While it is known that his strings were controlled elsewhere, but he was a willing participant. 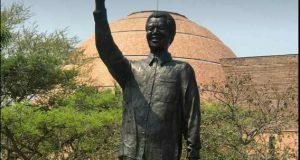 He leaves behind having achieved what the apartheid regime failed to do for decades – to kill the legacy of John Langalibalele Dube and Oliver Tambo. The architects of apartheid will be very proud of you!